My first telescope was an Orion Short Tube 80. I consider this as a very good telescope for a beginner being in the same time very good value for money. Portability is not heavy, and its small focal distance makes Orion Short Tube, very easy to pack in small case together with its accessories. The most difficult to carry will be the tripod. You don't need a car to take all your gear with you. The reason I know is because I do not own a car. 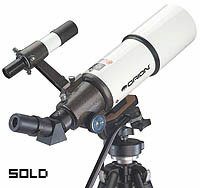 Price it is just a little bit more expensive than one of the telescopes sold in Super Markets but you get a lot more in quality, features and performance. Good optic quality for its price it is surprisingly good quality. The optics is good and also the focusing system. The whole construction is robust and look neat. Good Viewfinder Not bad quality and easy to look through. No Tripod You need to buy a decent tripod, that will cost you probably as much as the telescope. But look at the bright side: you will own a good tripod that will be useful for photography, video and astronomy. Buying a cheap tripod will cost you in the end more, because you will buy a good tripod anyway. I recommend you a Manfrotto for video with a so called fluid head.